From the moment each child enters the Early Years Foundation Stage, we are committed as a school to providing opportunities for developing their awareness and understanding of the letters and sounds system. At Claycots Primary School, when pupils enter Reception, they take part in high quality phonics sessions every day. These are fun, interactive sessions involving a range of speaking, listening, reading and writing opportunities. The emphasis in these sessions is on active participation. The aim of these sessions is to develop a child’s phonic knowledge to support their speaking, reading and writing activities. Letters and Sounds is a Phonics resource published by the Department for Education and Skills in 2007. It aims to build children’s speaking and listening skills in their own right as well as to prepare children for learning to read by developing their phonic knowledge and skills. It sets out a detailed and systematic programme for teaching phonic (sound) skills for children starting from the age of five, with the aim of them becoming fluent readers by age seven. Letters and Sounds is the Phonics resource used at Claycots School. The Letters and Sounds programme is introduced in Nursery as Phase 1 and continues throughout the Explorers to the End of Discovery. 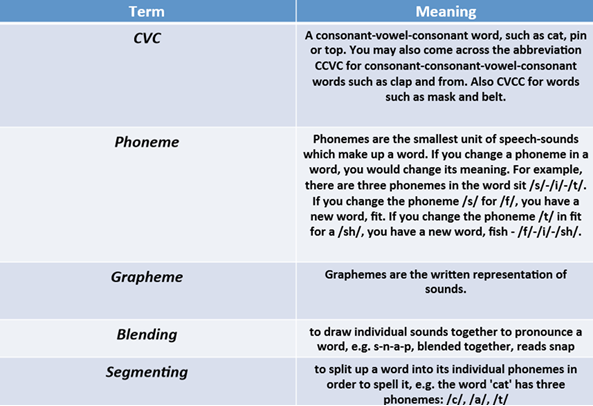 Those pupils who require further consolidation to secure their knowledge of phonics to read, receive small group intervention opportunities in Venture and Horizon phases. There are daily phonic sessions in Reception and Year 1. Phonic sessions and phonic interventions are also taught throughout the week in Year 2. Phonics sessions are carefully planned and delivered to meet all the needs of pupils in the class. There are also opportunities planned into these Year Groups for individualised or small group work, for those pupils who may require it. 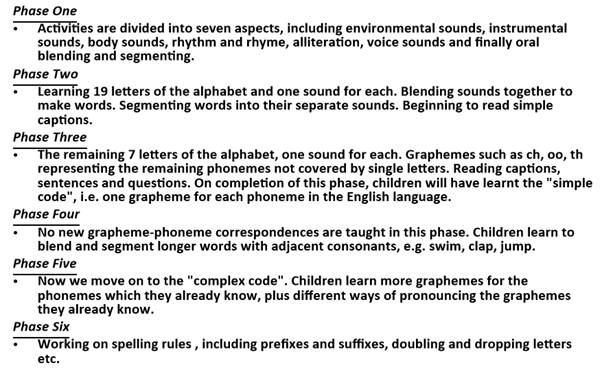 The Letters and Sounds Programme is divided into six clear phases, each with a phase building on the skills and knowledge of previous learning. Children have time and opportunity to practice and expand their ability to read and spell words. They are also taught to read and spell ‘tricky words’, which are words with spellings that are unusual or that children have not yet been taught. Children will be taught phase 1 in Nursery. They will then move on to phase 2 in Reception and by the end of the Reception Year children are expected to be working towards Phase 4. In Year 1 children will consolidate phase 3 and 4, they will then be taught Phase 5. At the end of Year 1 children are expected to have secure phase 5 knowledge, so that they are ready to sit their phonic screening test. The check is not about passing or failing but checking appropriate progress is being made. If children do not reach the required standard, then we will be in touch to discuss plans and offer additional, tailored support to ensure that your child improves their reading skills. Children progress at different speeds so not reaching the threshold score does not necessarily mean there is a serious problem. Your child will re-sit the check the following summer term. In our school we already identify individual children who need extra support and provide early intervention support, however we must comply with the statutory requirement.